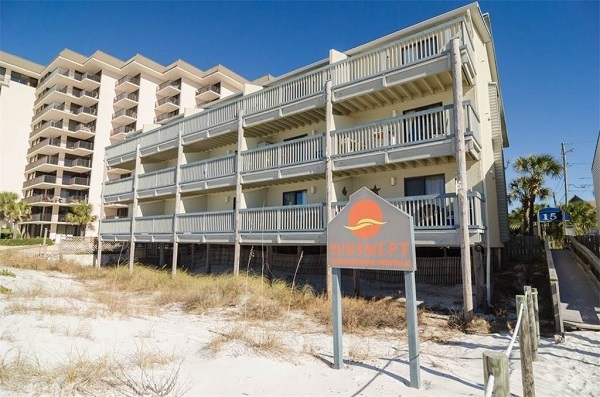 This 2nd floor condo is the perfect getaway for Panama City Beach, everything you want beautiful beaches and crystal clear waters on the Gulf of Mexico. 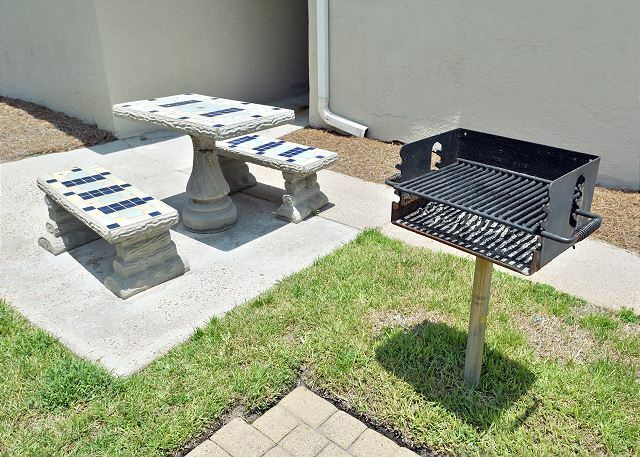 Located right in the middle of Thomas Dr. We have purchased 2 beach chairs with an umbrella to take to the beach for guest to use while staying with us. 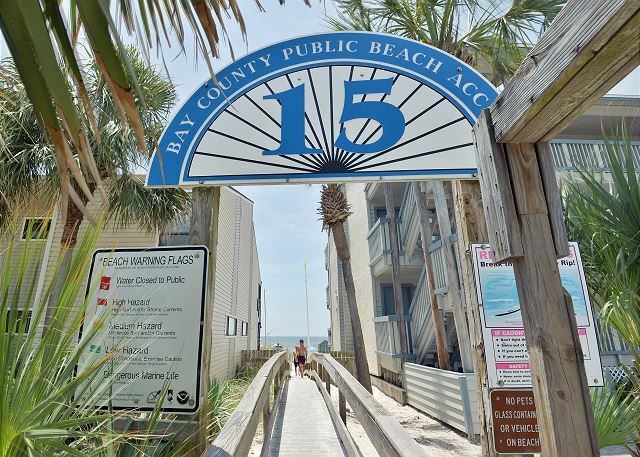 A vacation property that everyone can afford and stay at the most beautiful beaches in Florida. With the savings on rent you will have hundreds to use on the great restaurants, amusements parks, shopping, deep sea fishing etc. and with a quiet place to rest when you get back to your unit. Large flat screen TV's and internet so come on down! Sunswept is a small, quiet, family oriented property. This condo sleeps four with a King size bed in the master suite and a Queen Size sofa bed in the living room. The master bedroom offers plenty of storage area, room to hang your clothes, a television, and a washer and dryer for your convenience. The kitchen is fully equipped with full-sized appliances. Beautiful condo. I love the way it was decorated. Kinda small though. Staff was very helpful when I had questions. No ocean view at all. I was disappointed with this feature. Very, very reasonably priced. The Sunswept property was just as described, very clean and well maintained. It had all the comforts of home. The management was very helpful and we especially appreciated the in house laundry and the easy beach access. We would recommend this property to future guests. Clean and neat a little small definitely not a 4 person stay unit. This condo is small, a middle unit with floors above and below. It was quiet since it seemed we had the place nearly to ourselves. It's a short walk to the beach but no beach view. The unit was clean and had plenty of kitchenware for our Thanksgiving meal for 3. The minor issue was with the tub. When we showered, water was pooling, turns out the drain was clogged with hair. Would have been nice to have a how to for the television system, there were extra cords and 2 older adults had to figure it out on their own. Other than that the beds were comfortable, over all satisfied with this condo. We were on the sand in a minute, right by the pool and the complex was very quiet. The unit was nicely updated and clean. We had a great time. Yes it was very pleasant and peaceful!!!!Thanks!!! Cute Lil place to stay. We'd stay there again. It's a small cute rental w a very short walk to the beach. No need to cross any roads. Just walk through the back parking area and your feet will be in the sand. There are some minor (mostly cosmetic) improvements needed for this to be a 5 star. There is barely any closet space. One half of the closet is used up by washer/dryer combo. The other half is used by owners storing things like 3 very large pictures/mirror,extra pillows and old lamp shade. I was going to put our clothes into the storage drawers in the bed, which were so dusty that we opted to leave things in our suitcase. The bathroom shower had not 1 but 2 shower curtain rods which seemed pointless because the shower curtain was still dragging on the floor. The water in tub and sink took a long time to drain. I noticed that there was no hair dryer in the bathroom which magically appeared in a brand new box on day 2 after we had come back from the beach. Meaning someone was in the unit whithout giving us a courtesy call first. The kitchen was pretty well equipped. I wish there would have been just one good kitchen knife for food prep. None of the knives cut properly. Living room furniture was pretty uncomfortable. Everything we were hoping for!!! First beach vacation in 5 years and it was great! We were pleasantly surprised when we walked in because the condo had been redecorated/updated since the pictures were last taken! We felt VERY at home! The batteries in the thermostat were dead so we were not able to change the temperature the first morning we were there, but the maintenance company came in within 3-4hrs of making the service call and it was smooth sailing from there!! The walk to the beach was through a parking lot and down a boardwalk. Easy peasy! Great location and great experience! Cant wait to visit next year! 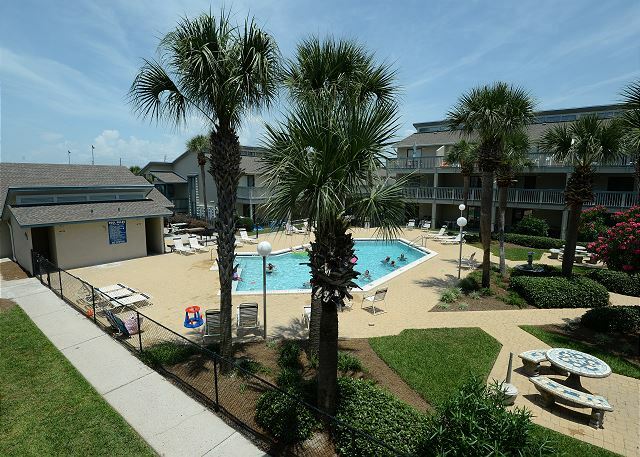 Great unit and very accommodating! Perfectly located! Overall, it was close to the beach which was really all I was looking for. It was quiet, and the AC worked. With 1 being the worst place Ive ever stayed and 10 being the best ever, I would give it about a 5. Its pretty mid range. -SUPER close to the beach, although not water front or beach front as described. (You are looking out over the pool from the deck though). -It LITERALLY is maybe 300 steps to the beach. Youre right off entrance 15. 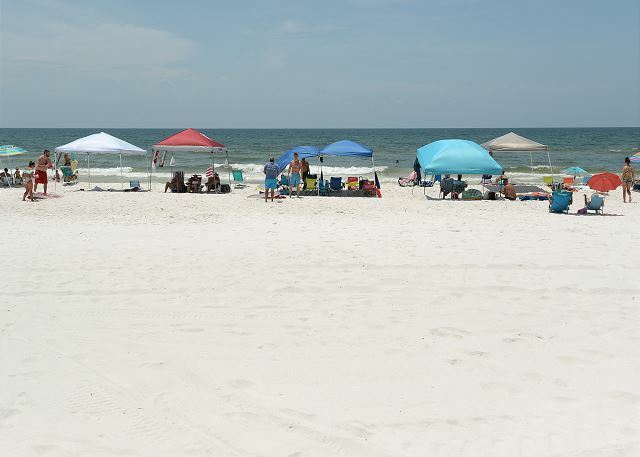 -It worked great for me because Im not in my early teens or 20s so being a little further from the main area of PCB meant it was also much quieter and the beach was not nearly as crowded. (Its about 2 miles from the Walmart). 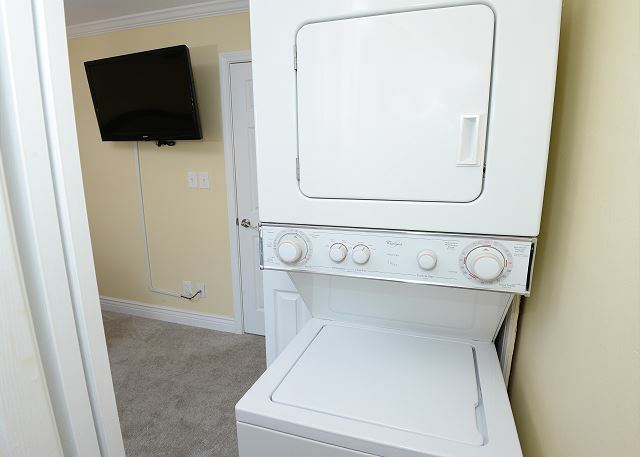 -The updated kitchen is very nice, and the in unit laundry is a huge plus since I didnt want to have to do laundry when I got home. The washing machine and dryer definitely work - we were able to use both of them. -The AC is definitely cold. Per the owners request, we didnt turn it below 70 - but honestly, we didnt need to. -The cable TV was great for the day we were sunburnt, haha. -There are extra pillows and blankets in the closet. -We loved the coded entry on the door and not having to worry about a key! -The refrigerator was not holding temp at all when we arrived - HOWEVER - we called 4Star and let them know and it was repaired. -The freezer does NOT make ice! I would highly advise buying ice at Walmart. -The bed is way too firm. Heather I want to thank you for the information about the need for baking and cookware needs. We have gone out and purchased new cookware, if you would have let us know we would have brought some over while you were staying with us. We are an offsite management company we all live on the beach and want to make sure you have everything in reason that you feel you need to have a great stay. Our rental agreement states to call us with anything that does not meet your expectations and we will try to remedy the situation right away. From the entryway we thought the condo was really charming. On checking further we saw that the bedroom carpet was badly stained. It looked so nasty, we wore flip flops to walk on it. The mattress was old, hard and uncomfortable; the pillows were small, flat and misshapen. By day 5 of our 2 week stay only the dryer was fixed. We tracked 4 Stars down in a distant of-site office. The owner's adult son looked shocked that we found him but he listened to our concerns politely and said the owner (his father) would contact us; he did not. When I said that the bed, sofa and carpet needed desperately to be replaced, he said, If we insisted the owner replace those things, they'd replace us with someone that would manage it 'as is'. Therein lies part of the problem. They rental company has no control. We gave up and determined not to spend any more time trying to get satisfaction that was obviously not coming. We deserve a partial refund. The condo owner's management company IS on-site and staff is nice and they maintain the exterior/common areas well but they have no control over rentals. We enjoyed our neighbours and the Sunswept development. Given the lack of oversight, we would not use VRBO again nor any off-site rental company. When we contacted VRBO they took 5 or 6 days to respond and then just said something to the effect of, Try to work things out. We've registered your complaints with Four Star. The place was clean and location was awsome. Some things to work on is I hd to call a few times to get blanket for sofa bed for my kids. Took 3 days to get blanket and sheets for the sofa bed. It was a good lthing my kids had a blanket in the car they travel with. Also said 2 beach chair and umbrella for the beach, only one chair and no umbrella. Had to buy one. 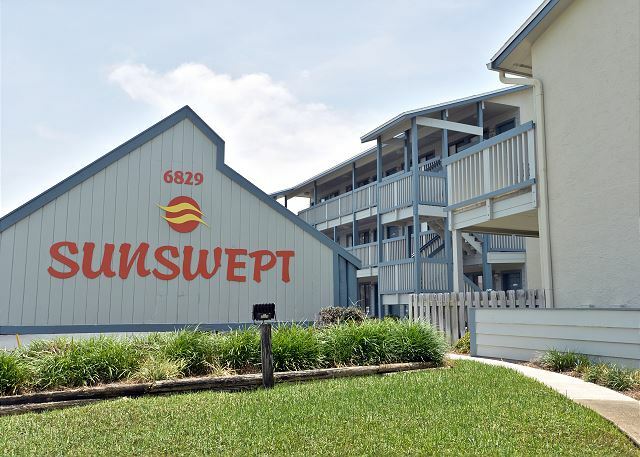 We had a very nice vacation and would stay at Sunswept 419. The chairs and beach umbrellas that were provided need to be replaced as we couldn't even use because they were broken. There were dirty floats all over the back deck and smelled. We were traveling with a child and the room had a tub but the stopper was broken and we had to rig it so it would hold water. Also it would look so much better to replace the carpet in the bedroom! But overall we had a great vacation with our family that stayed right above us. So convenient! Probably the worst in our 15 years of vacationing in Panama City Beach. Four Star Condo services was awful and would never use them again. Room needs cosmetic and furniture upgrades! 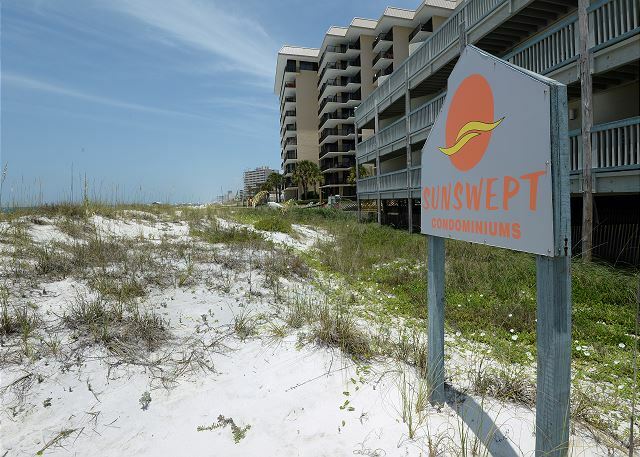 Sunswept property management was virtually no existent. Smoking is allowed at the pool and several people were deep frying seafood at the pool until 11 pm. Just not a good experience all together at all! The condo was exactly as described. We really enjoyed staying here, it was a little more relaxed and laid back compared to the larger complexes. Would stay here again! Just a heads up to the owners, this is not a complaint, but the balcony doesn't look like it has been cleaned. Not sure if your service is supposed to take care of that or not. Also, one of your beach chairs is broken. Just thought you would like to know. Condo and location were great, pool was very nice and beach was a stones throw away. The condo was very comfortable and had most things to make it feel like home. My condo was modern, clean and looked better than the pictures portrayed on line. The location was very easy to find and was close to several stores; Walmart, drugstore and entertainment. One thing that the management needs to address is having the pool heated for guests. We loved our stay and would like to return again soon. The pool was large and cleam and the ocean was only 50 steps away. Had a great time, property was as good or better than advertised. We enjoyed our stay and may visut again. Sunswept was the perfect place to stay! Our second floor condo was clean and nicely furnished, including washer/dryer, table/chairs on the porch and beach chairs to use. The beach was not super crowded and was so beautiful!! I never imagined being able to afford such a nice place so close to the beach...I will definitely be returning! The rental needs to be deep cleaned; lots of dust, scuffs and marks on the walls, broken picture sitting on the floor behind the sofa, spots on the bedding and carpet. The cleaning fee must be for quick pickup and linen change. The bed is super UNcomfortable, you can feel every spring in the mattress... think of it like you're sleeping on a spring board in a bouncy house; every time your partner moves you bounce like a bean. The living room furniture is outdated and uncomfortable. The nicest part of the condo is the kitchen but it's so small two people cannot be in it at once.. If the refrigerator door or washing machine is open it hits the other side of the bar and you're trapped. There is an obvious slant of the front balcony (building structure issue) kind of scary when you notice it. And finally, the condo company called me when it was storming and told me it's the renters responsibility to bring in ALL of the furniture and beach supplies from the back patio... this was an impossible task with no one to help me and a condo so small nowhere to put it. There shouldn't be a patio set if it's not going to be looked after by the rental agency.